Who Are the Academy Members? The National Academy of Television Arts & Sciences (NATAS) is the premier and most recognized non-profit organization dedicated to the advancement of excellence in television. 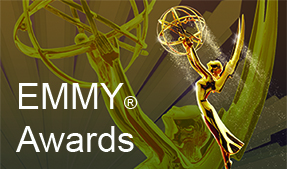 The EMMY® statuette is the most prestigious, peer-judged honor in television for outstanding creative achievement. The Academy gives EMMY® Awards for domestic television. Its International Council gives EMMY® Awards for foreign television. ATAS (Academy of Television Arts & Sciences) was founded in 1946 in Los Angeles; San Francisco was the first chapter chartered, November 30, 1949. NATAS (The National Academy of Television Arts & Sciences) was formed in 1957. The Academy now serves all the television markets in the United States through its 20 chapters. The San Francisco / Northern California Chapter joining on October 6, 1961. Now one of the largest chapters, it represents California markets from Visalia to the Oregon border, Hawaii, and Reno, Nevada. PROFESSIONAL MEMBERSHIP is a privilege extended to those actively engaged in television who make direct contributions to the industry such as executives, producers, performers, announcers, newscasters, technicians, writers, directors, artists, designers, photographers, and editors, among others. Professional (voting) members must have been engaged in the profession of television for at least one year to be approved by the Membership Committee. ASSOCIATE MEMBERSHIP is offered to those who are interested in and support the advancement of television but cannot be classified in the designated professional categories. STUDENT MEMBERSHIP is offered to those who are enrolled in accredited telecommunications courses at area colleges or universities. LIFE MEMBERSHIP honors Chapter Presidents at the completion of their term of office. Click for New Membership Application. Returning Members can Renew Membership here.